The FANUC controls on your Enshu machining centers have batteries to backup the CMOS memory where part programs, offset data, and system parameters are stored. Maintaining the proper battery life is important for minimizing down time and staying highly productive. In order to keep your FANUC control running smoothly, check out these three frequently asked questions to never miss a machining minute. When do I replace the battery in my FANUC control? An alarm is generated on the FANUC control if a low battery condition is detected. At that time, batteries should be replaced immediately to avoid losing the home position. 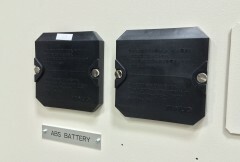 The batteries are mounted in a black box on the main electrical panel door, and each box has 4 “D-Cell” alkaline batteries. When replacing the batteries, keep the power on (machine screen must be ON). To prevent home position loss, replace with high quality batteries annually. We recommend placing a date sticker on the battery box as a reminder. What do I do if I lose the home position on my FANUC control? The home position on your FANUC control can be lost due to the battery alarm being ignored or if the machine was powered off for too long. If this occurs, recovery of the home position on most Enshu machines is easy and takes only a few minutes with no special tools required. Using the knob on the hand wheel pendant, simply select the axis that needs to be zero-returned, select Zero Return mode, close and lock all doors, and press Cycle Start button. The axis selected will move slowly to the mechanical stroke limit stopper and gently bump the stopper two times. The FANUC control precisely detects the motor torque when contacting the stopper to establish its precise position. The axis then backs away from the stopper by a fixed distance, which is set in a parameter by the factory. The axis is now at home position. A power cycle will clear the alarm and recovery is complete. Do I need to replace the backup battery? Yes. Located just behind the screen display, a lithium battery is used for backup parameter and program memory. This battery should be replaced when the “BAT” indicator is blinking on the FANUC screen. When it blinks, be sure to perform a backup of the control, and then replace the battery immediately before powering off again to prevent any data loss. 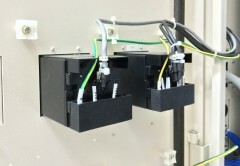 If you have additional questions about the battery in your FANUC controls, we’re here to help. Contact us today.